As Congress debates the Voting Rights Act, North Carolina rushes to implement a new voter suppression law. The Senate version of the bill, posted today, is significantly tougher than the House bill passed in April. North Carolina was one of fifteen states subject to Section 4 of the Voting Rights Act, which the Supreme Court recently ruled unconstitutional, so the state no longer needs to clear its voting changes with the federal government. North Carolina Republicans have acted accordingly, making a very bad law even worse. According to the state’s own numbers, 316,000 registered voters don’t have state-issued ID; 34 percent are African-American and 55 percent are registered Democrats. Of the 138,000 voters without ID who cast a ballot in the 2012 election, 36 percent were African-American and 59 registered percent Democrats. The new draft of the bill does not allow student IDs for voting, making it among the most restrictive laws in the country. It’s worth noting that voter fraud in the state, which the legislation purports to stop, is incredibly rare; there were only two alleged cases of voter impersonation between 2000 and 2010, when millions of votes were cast. A number of other harsh voting restrictions—such as cutting early voting, ending same-day voter registration and penalizing the parents of students who vote where they go to school—could still be added to the bill or considered separately by the legislature before they leave for the summer. See my post “7 Ways North Carolina Republicans are Trying to Make it Harder to Vote” for more details. —NO college student IDs are acceptable (House allowed NC public universities and community college ID). —NO out-of-state driver’s license is acceptable unless you’ve just recently registered to vote (i.e., less than 90 days before the election where you’re showing your ID). House allowed government photo IDs created by other states. —NO North Carolina county or municipal government or public employee IDs is acceptable. —NO photo ID issued by a public assistance agency is acceptable—another slap at low-income voters. —House allowed expired photo ID to be used, up to 10 years after expiration. But Senate version only allows the other House exception: a voter over 70 can use an expired photo ID for any length of time if it was current when they were 70. —NO advisory board, as in House, to advise State Board of Elections about strategies and partner groups to use in a comprehensive education program about the ID requirement. —NO provision for additional staff at State Board to do education. —NO reference to using the Judicial Voter Guide to include information about ID. 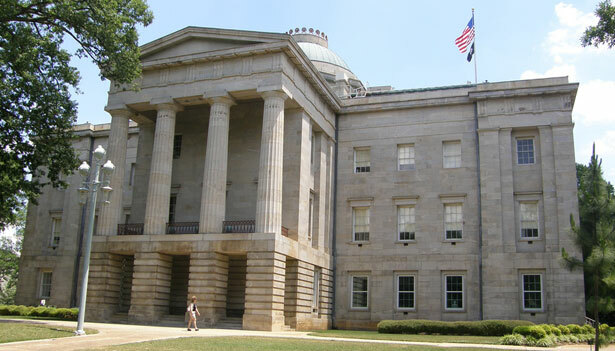 The actions of the North Carolina legislature are a case study for why Congress needs to revitalize Sections 4 and 5 of the VRA and strengthen other parts of the law (see my related story, A New Strategy for Voting Rights). North Carolina will soon become the sixth Southern state to pass or implement a new voter ID law since the Supreme Court’s decision last month. The next Moral Monday protest, on July 22, will focus on voting rights—it promises to be a timely occasion.